Frank Funaro has been playing the drums for quite some time now. A founding member of eighties rock n' roll titans the Del Lords, he has since been part of Camper van Beethoven, The Dictators, and The Brandos. 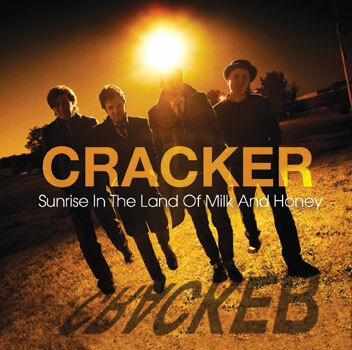 He's been playing with Cracker since 1998's Gentleman's Blues, and can most recently be heard pounding away on the band's excellent Sunrise in the Land of Milk and Honey album, out earlier this year. With Frank's years of experience comes an unearthly obsession with the drums. He has written in extreme detail about his own methods, and more or less comes across as an absolute authority on drumming as a whole. As a result, I jumped at the chance to grill Frank on what he considers his ten favourite drum performances. The results span from well-loved standards to less obvious gems; read on...! Peep Frank on the far right! Hey, any list like this is sure to date me. I don't much care for the crazy drumming the kids do today, with the dreadlocks and the Pro Tools... Hey... GET THE HELL OFF MY LAWN!!! Um, sorry, where was I? "most likely to give me a seizure" ([I actually mean this in a good way...] think: anything by Necrophagist). So, without further ado, and in no particular order, as of May/June 2009 - My Favorite Drum Performances Of All Time. Yeah, yeah, I KNOW... When The Levee Breaks is one of the most loved drum grooves of all time, and with good reason. And heavier than the heaviest Metal with a capital M. But this particular slab 'o Bonzo has always been one of my favorites. The drumming on this? A beautiful example of delicious restraint and taste. Jeezis, how many bars before the drums even enter? And how many bars before the kick/snare drum "AND-FOUR-AND" hits you in the head with a 2X4 and brings the entire swingin' (and I mean SWINGIN') beat in? And how many bars did Bonham visit prior to arriving at the studio that day? Go ahead, take this song for granted. Sure is a classic rock staple, innit? Heard it a million times, haven't you? But you show me one bar band drummer that plays this correctly and I'll eat my hat. The Texas shuffle in all it's greasy glory. This is before the drum machine reared it's ugly plug and propelled these guys into the unit-shifting stratosphere. Feh. (Added fun: The one without the beard is named Beard). Speaking of the Texas shuffle in all it's greasy glory... This groove is HUGE. TREMENDOUS. If it was any further back in the pocket, the song would start to go backward. And then my head would explode. And then, as the time-space continuum ripped like a cheap dress on prom night, all right handed drummers that shuffle this song on the hi-hat with their RIGHT HAND would be cast into the abyss with an Ipod Shuffle loaded only with "It's Hip To Be Square". And crazy glue in the USB port. Any drummer that doesn't understand that Ringo Starr is better than Neil Peart needs to have their heads examined. And confiscated. Any drummer that doesn't understand that Charlie Watts is a GOD OF GROOVE ought to get a couple of turntables and become a DJ. I hear they get chicks. As far as their drumsets go, I've got two words for them. (Hint: The first one is "Craig's"). A great synthesis of straight rock and shuffle, this guy is so very swingin' on this track. It hearkens back to them days when Jerry Lee and Chuck and Little Richard were inventing the whole damn genre, and drummers could swing like hell, but they didn't even know HOW to play straight eights. This was the late 50's, and nobody thought rock and roll would last. Maybe it didn't last, I mean, Madonna is in the Rock And Roll Hall Of Fame, so, what does THAT say about the end-times, hm? Yeah, ok, I "get it", Rock and Roll is a state of mind. But it's also a style of music. And Mr. Ardolino is one of the last guys who still know how to play it. Hey, I'm a drummer. I dig "over-the-top, virtuoso-type" playing as much as the next drum-geek. This is not "rock n roll", nor did it ever pretend to be. When I first started picking up the sticks, this performance made me want to put them back down again... and go get a day job. I used to slow the 33 rpm disc down to 16 rpm, trying to learn how to play this, and it still made no earthly sense to me. These guys were ON FIRE, though. It was called fusion jazz, but it was loud and passionate. The added bonus? NO VOCALS. If you're going to play music as intricate and complicated as this, there ought to be a law against getting some helium-voiced golden boy up onstage to prance about like a renaissance-faire-actor's-guild moron-in-tights spouting Lord Of The Frigging Rings fantasy unicorn nonsense. There ought to also be a law against getting some only-owns-black-clothing-human-ink-receptacle mook who bases his entire vocal delivery on the vocal stylings of the Cookie Monster. If somebody had written lyrics to the music of the Mahavishnu Orchestra, I fear the two would TOTALLY cancel each other out into vapidity and you'd be left with - what? Billy Joel? You know those hackneyed expressions like "shock the world", and "it changed my life"? Well... It did, and it did. I don't even know where to begin. Hell, the guy behind the kit was a PRODUCER. The gangly lead singer was the drummer. Bright Idea Department: "You be the frontman, and I'll learn how to play the drums. From scratch. In perfect time, and with groove. And, oh, by the way, we'll do gigs in front of people while I'm learning. And while we're at it, we'll change the face of popular music FOREVER. Ok, guys?" I remember my right arm seizing up trying to play the speedy ones, Judy Is A Punk, Chainsaw, Now I Wanna Sniff Some Glue - YIKES! A whole lotta water has gone under the bridge since this came out - drummers can play so fast these days it'll scare your cat, (hell, live Ramones gigs were even faster than the records - by a LOT), but this debut album got the eighth-note ball rolling in a big way. (Hey, I know naming an entire record as a drum perf is cheating, but... the songs were what... 40 seconds long each? Cut me some slack). Holy sh*t. Is this the best drum performance EVER? It very well could be. I mean, not even opinion here. Backbeat for DAYS. I can't figure out how to play like this, and neither can Neil Peart. Seriously, Al Jackson grooves like a monster, a god, a genius of rhythm on this pulsing heartbeat of a track. There isn't a way in the world the snare drum could be any further back in the pocket. That's as far as it can POSSIBLY go. Wait a minute. I've got to re-write my whole damn article now. What about Al's playing on �In The Midnight Hour�? What about his great work with Otis Redding? With Al Green? What about the drummers of James Brown? What about the forty other songs with Ringo and Charlie on 'em that blow my fragile-eggshell mind? What about Keltner? Moon? Scabies? I can't turn this piece in now. I'm embarrassed. Don't print this. Gimme one more chance, I swear I'll pick better drum performances.